Story updated at 6:19 p.m. with additional information. 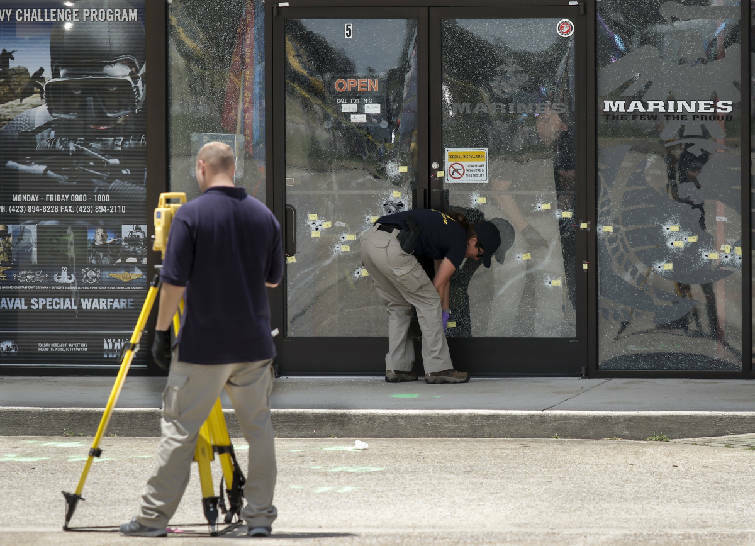 Investigators with the FBI work the scene of the July, 16 shooting at the Armed Forces Career Center on Lee Highway on Saturday, July 18, 2015, in Chattanooga, Tenn. U.S. Navy Petty Officer Randall Smith died Saturday from wounds sustained when gunman Mohammad Youssef Abdulazeez shot and killed four U.S. Marines and wounded two others and a Chattanooga police officer at the Naval Operational Support Center on Amnicola Highway shortly after firing into the Armed Forces Career Center. FBI agents raided a residence in Red Bank to investigate a lead about an associate of Mohammad Youssef Abdulazeez on Monday night at Mountain Creek Apartments. The apartment was home to a Muslim family of six kids and a widow, according to neighbors, and one of the sons knew Abdulazeez. The FBI has not released what, if any, information it uncovered during the raid. Neighbors said the FBI was at the residence from about 6 p.m. to 2 a.m. Tuesday morning, looking through the apartment and a nearby dumpster. "We've been going all over this city talking to friends and associates of our shooter," said Ed Reinhold, FBI special agent in charge, outside of the Mountain Creek Apartments on Monday night. "In order to make this investigation completely done, we go around and talk to everyone we possibly can who may know or been associated with the shooter." According to neighbors, the family was nice and kept to themselves. The Tubbs family lives right next to the apartment the FBI raided, and said their son slept over at the place several times and was good friends with a couple of the boys. "They're nice people," Alexis Tubbs said. "My little one goes over all the time and plays with them. They're a nice family." Chattanooga slayings prompt state, federal changes on military members being armed in U.S.
Navy plans to station armed guards at reserve centers across U.S.
Are we helping extremists recruit our lost children? When will the shooting stop? Tennessee ramps up handgun permitting for Guard, but can they bring firearms to work? Terrorist or extremist, was Abdulazeez a man with a plan? How will last week's attack affect Chattanooga's brand? Crowd awaits Westboro Baptist protesters at Chattanooga shooting memorial on Lee Hwy. Will the shooting change life for Chattanooga Muslims?